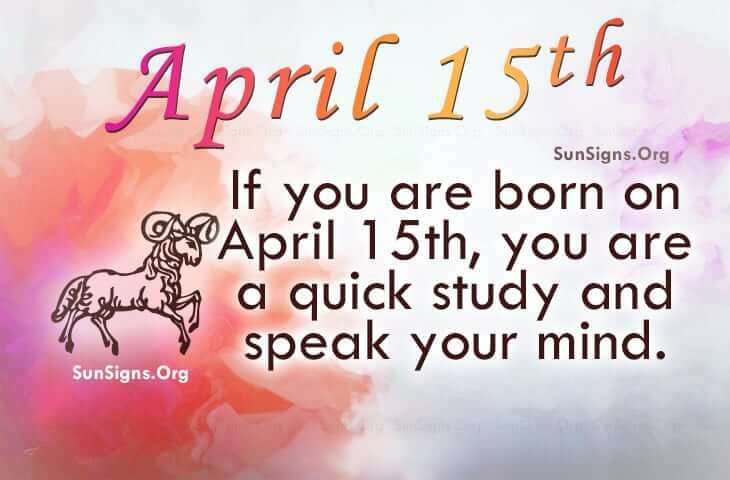 Famous people born on APRIL 15 are very smart. It doesn’t take much for them to get it. As an Aries, they are a quick study. When it comes to conflict, they will stand and fight. But typically, they focus on the bigger picture and will walk away from most battles. This is not a sign of weakness but of strength. On the other hand, when they have reached their boiling point, they don’t care who is around. They just blow over the top. They surprise people when they do this as it is so not them. People think they are some mousey creature that let people run all over them. Ummm… wrong! Famous people born on April 15 are strong and stubborn. They also desire to be loved. As a drawback, they tend to be a bit jealous and are guilty of having double standards. As a profession, they may have a few things in mind like the judicial system or the world of technology. They would be great in either profession. Famous birthdays of April 15th have many traits. They are not shy individuals. Aries are people who speak their minds even in public. Otherwise, uncomplicated, they deal with situations instead of complaining. They are not typically the authoritative parent but want to be loved and respected.